"GOLD WINNER of the FOREWORD REVIEWS' 2015 INDIEFAB Book of the Year Award." Somewhere in an ancient stand of timber comes a request from an aging lumberjack. "I need me a will," Paul Bunyan informs his camp's scribe and bean-counter. "But a will ain't just a will, Johnny. It's a testament, too. What a man wants folks to remember 'bout hisself." And so it begins, the story of Paul's life resurrecting characters like Sourdough Sam and Shot Gunderson along with members of the Potawatomi and Ojibwe tribes whose dreams predict the legend of Bunyan and his blue-hided ox. The deep woods are redolent with beauty and mystery, but also peril. Paul is forced into a dreadful contest with Swede Sturleson, a timber baron emblematic of The Gilded Age. Paul will not emerge unscathed in the course of that long encounter. But something gets born in the interim, something akin to myth or hope, and in that place Paul Bunyan stands without exaggeration. 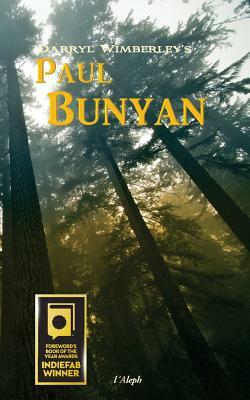 "What more is there to know about Paul Bunyan? Plenty, from the logging camps of the late 1800's to the start of mechanized tree harvesting--and the giant of a man who spanned it all. Darryl Wimberley's narrative is no mere tall tale but a full-fledged novel, with details so vivid, you can smell the wood shavings. Along the way are a band of colorful characters like Sourdough Sam and Shot Gunderson, and a bitter feud with a lumber magnate who wipes out (almost) anyone who crosses his path. "A logger's life is magnificent and obdurate and stark," Wimberley notes, but Paul's accomplishments are feats of true daring, and this account gets it all down on the page." - David Galef, author of My Date with Neanderthal Woman DARRYL WIMBERLEY has been recognized for both novels noir and literary work. A Tinker's Damn won the ForeWord Award for "Best Literary Novel" in 2001. The King of Colored Town was the first novel to garner the Willie Morris Award for Fiction in 2007. Darryl writes, works, and lives with his family in Austin.